Don't Throw Away That Pencil Yet! Popular wisdom might tell us that learning how to write by hand -- creating letters and shapes -- is an anachronism in the age of keyboards and touchscreens, but a Wall Street Journal article and accompanying blog beg to differ. "The practice helps with learning letters and shapes, can improve idea composition and expression, and may aid fine motor-skill development." "In children who had practiced printing by hand, the neural activity was far more enhanced and "adult-like" than in those who had simply looked at letters." "Handwriting differs from typing because it requires executing sequential strokes to form a letter, whereas keyboarding involves selecting a whole letter by touching a key...Pictures of the brain have illustrated that sequential finger movements activated massive regions involved in thinking, language and working memory—the system for temporarily storing and managing information." 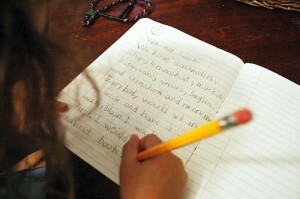 Ironically, it may be modern technology that gives a boost to handwriting’s resurgence. For anyone whose kids balk at or have trouble with traditional handwriting instruction, the arrival of new educational games for the iPhone, iPod, iPad and other touch screen devices may come as a welcome teaching aid.